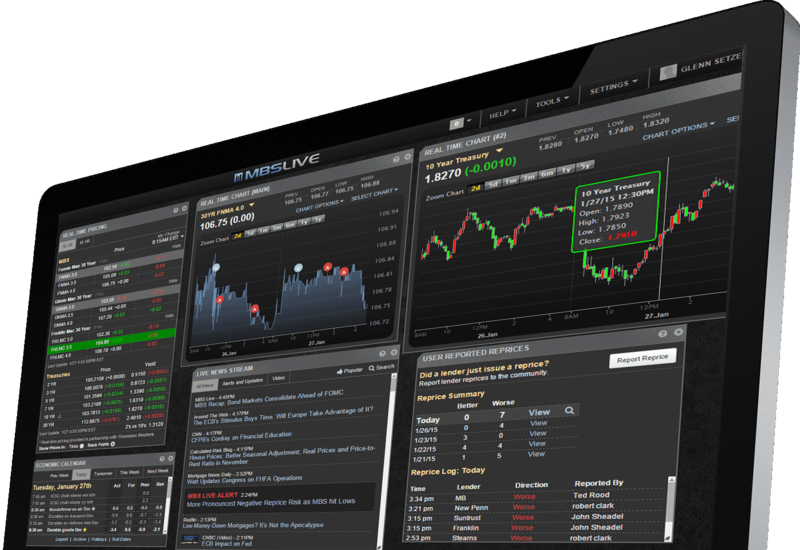 Live Reprice Alerts, Live Streaming MBS and Treasury Prices and Mobile Access. Watch MBS Live Featured on CNBC TV! Here are a few of the features you get with an MBS Live subscription. Learn more about the dashboard or start a free trial and access it instantly. Your subscription includes full access to our live streaming mobile app. Anything you can do on our web-based dashboard, you can do on MBS Live Mobile. 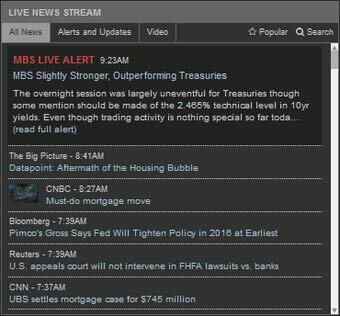 Watch MBS / Treasury prices, alerts, news and chat as they all stream live to your mobile device. Try it free now. The bread and butter of our service, our industry leading instant reprice alerts will keep you informed of lender reprice risk, market critical events, etc. Reprice alerts are delivered to your dashboard, email, text messages and our mobile app. Other services will claim live data, which is simply false. 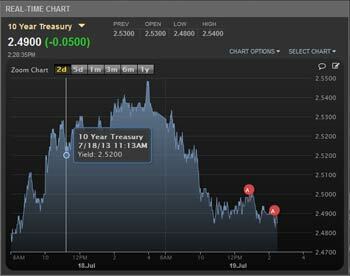 Want to know where the 10 Year Treasury yield is prior to market open or if FNMA 3.5 has moved 50 basis points today? 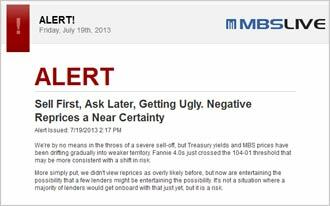 MBS Live offers three newsletter style recaps daily. Morning, mid-day and afternoon updates include market commentary, top news headlines, dashboard discussion highlights, economic data, etc. Text here potentially with a link to the screenshot. MBS Live is a web based application and all updates are automatic and completely transparent. No hassles or headaches with software updates. Our services are accessible via your web and mobile browsers. Even though the sum of our parts is impressive, MBS Live is about so much more than MBS Prices. The ultimate goal is to ELEVATE the collective understanding of what's moving markets and what the relevant lock/float considerations are at any given time so that our clients can be "the expert" for their spheres of influence. 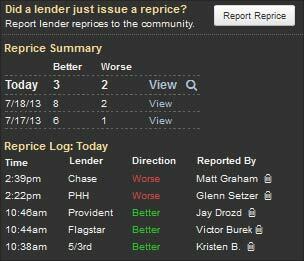 Keep track of lender pricing activity as other members of the community report lender reprices live throughout the day. Keep track of lender pricing activity as other members of the community report lender reprices live throughout the day. Our community tracks and reports reprices on over 60 lenders across the country. 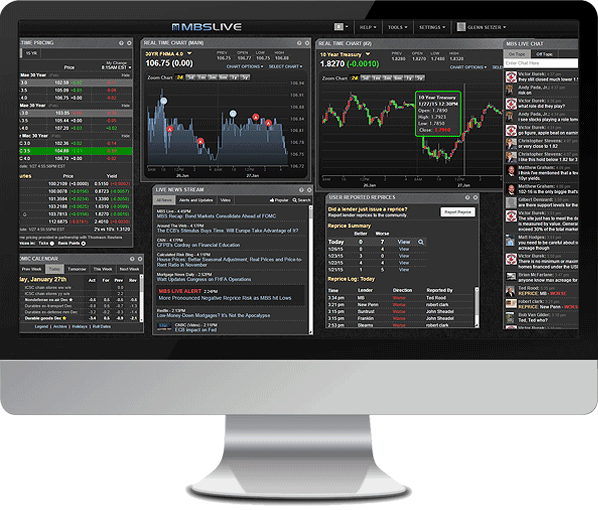 Watch markets react in real time as economic data is released. 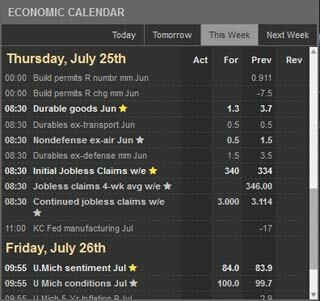 Our econ calendars update in the instant data is released. Economic events are rated by our analysts by order of importance giving your insight into the more important events. Display options include today, tomorrow, this week and next week. Stay informed with our continuous feed of hand-picked, up to the minute industry news from over 200 partners and sources. Major Media Outlets (CNBC, Thomson Reuters, Bloomberg, WSJ), Industry Publications(Mortgage News Daily, Housing Wire, Inside Mortgage Finance, etc. ), Industry Associations (MBA, ABA, NAR, NAHB, SIFMA, CSBS, etc. 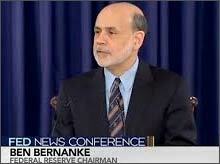 ), Government Sources (Federal Reserve, FHFA, HUD, CFPB, Treasury, NMLS, Fannie, Freddie, etc). Live TV Events such as Fed Announcements, Live Webcasts such as CFPB Events, Live Webinars such as product training, etc. all streamed directly to your MBS Live Dashboard. Our analysts don't just issue the occasional lock float alert here and there.They actively participate on the dashboard, with the MBS Live community, throughout the day, issuing alerts, giving market updates, educating our community and answer questions. This is just one more aspect of our service that sets light years ahead our competitors. Show multiple streaming charts on your dashboard. Active Analysis - Chart analysis posted by our analysts is synced in real time with your dashboard. Zoom charts from 2 day to 1 Year for any security including MBS and Treasuries. Event Overlays - you can choose to overlay events on your charts, showing reprice alerts and updates, user reported lender reprices, major news events, etc. Show 25, 50 and 100 day moving averages. 100% Web-based, No software to install. Access from any web browser. A product so captivating, many of our users purchase dedicated monitors keep MBS Live visible throughout the day. Your MBS Live subscription includes full access to our web-based mobile applications. Stay connected to the markets and the community wherever you go with MBS Live mobile solutions. Watch live streaming prices, get the latest alerts, watch chat, etc. Just about anything you can do on our web-based dashboard, you can do on MBS Live Mobile. "Amazing Product! Keeps me a head of the market and totally informed in all facets of the mortgage market. I was able to build a reputation that is nearly untouchable thanks to this website." "To give you an idea of how valuable this site is - one computer monitor is devoted to MBS Live all day on my desk." "If you are in the mortgage business and don't use MBSLive, you are costing you and your customers a lot of money! This is the best site out there, and has a great community to learn from! It literally pays for itself." "A true Market Leader...in every sense of the word! MBS Live couldn't have started with the result as their vision...its just too good!" MBS Live offers monthly and annual subscription plans. We also offer group discounts and corporate pricing plans. 2019 MBS Live, LLC. All rights reserved.